Using an automatic watering system ensures that your plants get just the right amount of water. These environmentally friendly plant watering devices prevent underwatering and overwatering so your plants have just the right amount of water at all times. This promotes healthier roots and stronger plants. It also prevents water overflow so you won't lose any soil or valuable nutrients. Before you begin, soak the Terracotta Plant Waterer in water and generously water plant. This helps to prevent the Terracotta Plant Waterer from pulling moisture quickly from the bottle. Made with the best terracotta, this special watering irrigation system will always keep your plant's moisture at optimal level. Enjoy your vacation or time away from home knowing your plants are well cared for. Innovational Plant Watering Stakes: Use recycled wine bottles along with these amazing terracotta plant watering spikes to create a self-irrigation watering system. 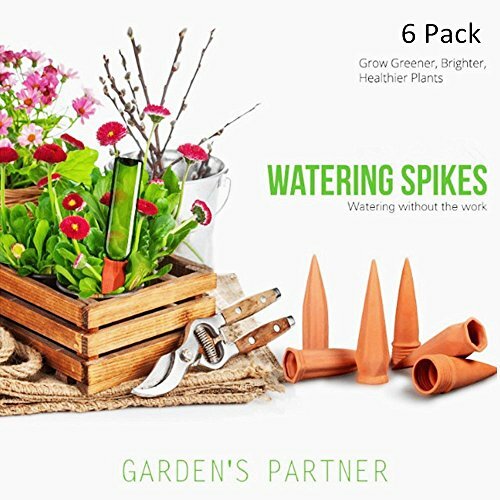 The Ideal Planter's Tool: Whether your plants are indoor or outdoor, at home or in the office, these self-watering spikes will keep your plants alive by delivering just the right amount of water to them preventing water overflow. Grow healthier plants by preventing over or under watering. Great Convenience: Travel more without having to worry about finding someone to water your plants. Value Guaranteed: As the water begins to run out, just refill the wine bottles so that your plants stay hearty and robust. For Plant lovers: This set makes a perfect gift for first-time gardeners or potted plant owners. Order yours today! If you have any questions about this product by SmartUlife, contact us by completing and submitting the form below. If you are looking for a specif part number, please include it with your message. Terracotta Self Plant Waterer,Plant Watering Spikes,Automatic Watering Device,Automatic Watering Tools-Automatic Gardening Tool for Travel,5.5"